Confession time: I was sorely tempted to start this Lengua Picante Recipe (Spicy Beef Tongue) with a tawdry joke about a butcher, a housewife, oxtail, and beef tongue. For this I have nobody to blame but Aunt Ilana’s husband, Pedro. Luckily, and for the sake of the children who visit our site I won’t go there, the joke would be lost in translation. Phew! Will somebody think of the children! My reputation having remained unsullied, allow me to go on about this dish. This is one of those dishes that sounds unappetizing at first, but the reality is far from appearances. 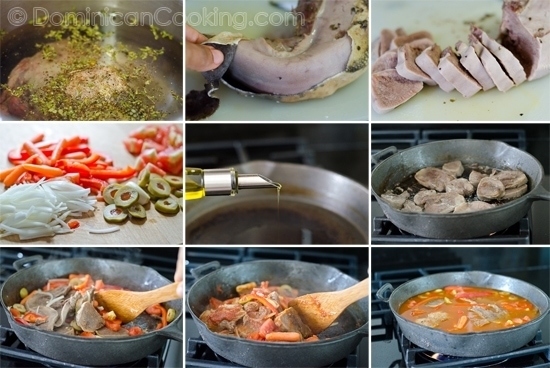 Beef tongue is pure muscle, a very tender, flavorful cut, made even more delicious by the sauce (escabeche in the Dominican Republic) in which it is served. And speaking of children, I would suggest you keep to yourself the, erm, provenance of said cut. No need to go into detail and gross out your kids. Hey, I didn’t lie to my daughter, I just assured her that the unusual-looking meat was absolutely beef. All she had to say was “Wow! That is some soft meat!” – “soft” meaning tender in her vocabulary. So yeah, hmm, tawdry jokes and keeping information from our kid. Another day at Casa Aunt Clara. Lengua Picante Recipe (Spicy Beef Tongue): a very tender, flavorful cut, made even more delicious by the sauce in which it is served. Boil the tongue until it is tender throughout but still firm, having added the oregano, a teaspoon of salt, and a teaspoon of pepper to the boiling water. Cool to room temperature. Remove the tongue from the water (reserve water and set aside for later) and peel the skin off the tongue (discard skin). Cut tongue into fine slices. Heat the oil in a cooking pan over high heat. Add the tongue slices and brown. Remove from the pan. Lower heat to medium and add the onion. Cook and stir until the onions become translucent. Add the garlic, bell peppers, carrots,olives, scotch bonnet pepper and cook and stir for a minute. Add the tomatoes and tomato sauce. Cover and cook over low heat until the tomatoes are soft. Add water that you had set aside and simmer until it is reduced to a thick sauce. Return the tongue slices back to the pan. Mix well and cook for a minute. Stir in cilantro leaves and season with salt and pepper to taste. Serve hot with arroz blanco or moro. I have not had lengua Dominican style none of my Dominican friends eat it… I have had Lengua in Mexican restaurants but have not made it at home… I will try this recipe. Is there a Dominican recipe for cachetes? My husband loves tongue but I have never had it before. I tried cooking it once and that was a terrible idea seeing as I had never done it before and was basically guessing as I went along. How do I know when it has boiled enough? How do I get that skin off? Is it supposed to smell terrible while boiling? How do you clean it properly? I’m sorry for the million questions I just really want to make this for my husband. I must admit I love Dominican foods authentic taste thanks for sharing it to us.